Chef Dan Capello, Executive Chef of Chenal Country Club, competing in last year’s Diamond Chef preliminaries. Capello won last year’s final and will compete against this year’s preliminary winner. Photo courtesy of Pulaski Tech. UPDATE 3/5/14: Specific competitor heat times announced here. What better setting for this year’s Diamond Chef preliminaries than a shiny new culinary school, right? The annual Diamond Chef competition is a fundraiser for the Pulaski Technical College Culinary Arts and Hospitality Management Institute, taking place in two phases. 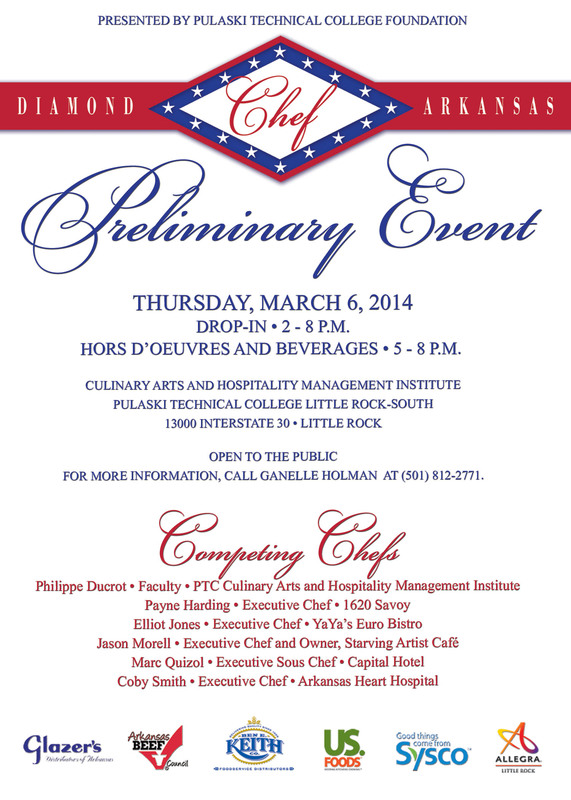 The preliminary competition, taking place at the school on Thursday, March 6, culls the field of several talented local chefs (see graphic below) down to one competitor, using an elimination-style setup. 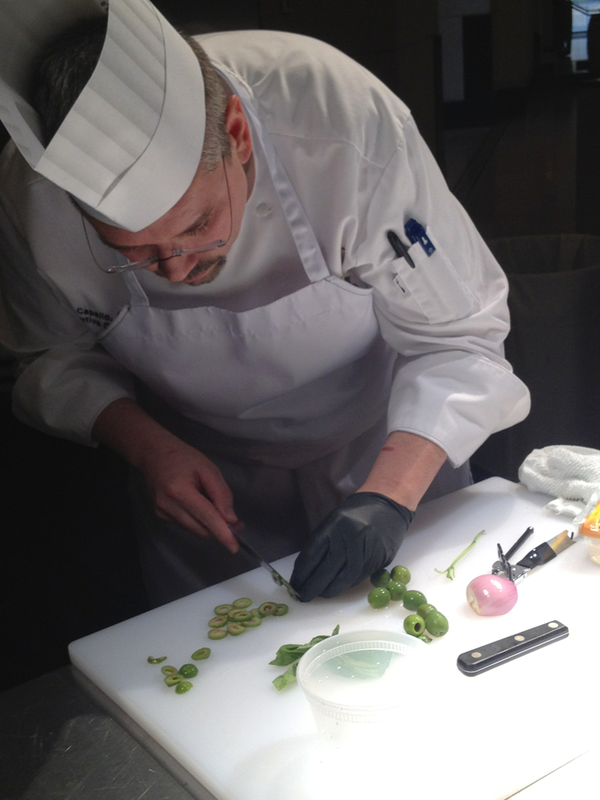 Each heat features a mystery basket of ingredients that both chefs in that round must use. Then later in the spring, at a ticketed event at the Statehouse Convention Center, the finalist goes mano-a-mano (or woman-o, if one had entered) on-stage against the previous year’s winner, Chef Dan Capello of Chenal Country Club, while the audience enjoys a multi-course meal. In the final, a single secret ingredient is revealed that must be used in each of at least three courses. This year marks the preliminary event’s move to the institute’s new building, which opened to students last fall. The preliminary had been held at the former Peabody Hotel in years past. If you’ve never been to the preliminary competition, it’s a great time to jump in. As opposed to the final, this event is free, and this year it will include some complimentary hors d’oerves and beverages from 5 – 8 p.m. (Thanks, sponsors!) You can drop in anytime between 2 and 8 p.m. to watch the action.